Domenico Vicinanza is a musician and a scientist. 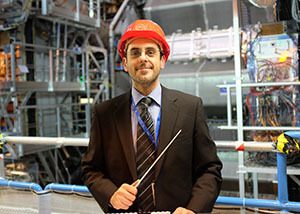 He received his PhD degrees in Physics working at the European Laboratory for Particle Physics (CERN, Geneva) and he is a professional music composer and orchestrator. Always fascinated by how music and science are a continuous quest for harmony, he was one of the pioneer of data sonification for scientific and artistic purposes. Since the end of 1990s he supported scientists in different fields, from hydrobiology to cosmology, from earth science to particle physics providing, through sound, different perspectives to their data. At the same time he worked on the artistic aspect of writing music from science, creating music pieces by mapping scientific structures to melodies and sounds. He organised several concerts with different ensembles, from solo instruments to chamber and symphonic orchestras, playing music from science. He has an active collaboration with CERN, which commissioned an orchestral piece on scientific data, for their 60th anniversary and with NASA, writing music from data collected by the Voyager 1 and 2 space probes. He has been lecturer in Algorithmic composition, Audio technology and Computer music at the University of Salerno in Italy, the Conservatories of Salerno and Avellino (Italy) and he is currently part-time lecturer at the Anglia Ruskin University in Cambridge (UK). Finally, he is also involved in the application of distributed computing and advanced networking technologies to music and visual arts as the founder and technical coordinator of the ASTRA (Ancient instrument Sound/Timbre Reconstruction Application) and the Lost Sounds Orchestra projects for the reconstruction of musical instruments on the Research and Education networks GÉANT and EUMEDCONNECT.